When did you attend St Margaret’s? I joined St Margaret’s in 1995 in Primary 2 and left after Sixth Year in 2007. What are your memories of your time at the school? I really enjoyed my time at school, I liked the close feel of the St Margaret’s family, with the small classes meaning that you knew not only the people in your year but most of the school including both teachers and pupils. Were you always interested in the science subjects? I enjoyed all the sciences at school, mainly because of the practical aspects – burning magnesium in chemistry, looking at leaf cells in biology and wiring up electrical circuits in physics – which I think then influenced my interest in engineering for further study. Physics was always my strongest subject so I was more drawn to taking it further. What encouragement did you get from the school with regards to STEM subjects? There was always strong support for taking the STEM subjects through S3 to S6, and many girls in my class went on to take all three sciences at higher level. Having a solid knowledge base from early STEM learning before S3 helped to make this an option for many girls. Going into S5 at school, I was already interested in engineering so continued with maths and physics at higher level and went on to study them both at advanced higher, as they were key subjects for university entry. At higher level, I also studied geography and computing, as well as English, as these were subjects I enjoyed and would give me an interesting and diverse subject balance. Was there any one teacher who influenced your decisions? Mrs Millar who taught me for physics higher and advanced higher was very supportive through stressful exam times, advanced higher projects and always tried to keep things fun. Extra-curricular activities were a big part of my time at St Margaret’s and I signed up for anything I could. I played violin (and latterly viola) in orchestra and the string ensemble, heading off to France, Germany, Ireland and the US on music trips. Hockey and netball were my main sporting interests, playing in the 2nd XI hockey team and becoming netball captain in S6. Which university did you go to and what did you study? I studied mechanical engineering at Aberdeen University, a five-year Masters’ course, graduating 6 years ago with first class honours. When did you join Chevron? I first worked for Chevron on a summer placement in 2010, between my third and fourth years at university. After a successful summer in Chevron U.K.’s Energy Technology Company, which is a strategic extension of Chevron’s Energy Technology Centre part of Chevron Upstream Europe, I then continued to work within the same team part-time during the academic year before returning for a second summer placement after fourth year. During fifth year, I again worked part time before being offered a full time job on Chevron’s graduate programme – Horizons – as a subsea engineer. Had you always wanted to work in the oil industry? I have always been interested in the way things work and the impact of machinery and new technology on our everyday lives. This led me towards the engineering discipline, but I had very little exposure to the oil and gas industry until I worked at Chevron. It is great that there are initiatives in place now that bridge the gap between school and industry so that pupils can get an understanding of the industry early on. Are there many female engineers in your team? 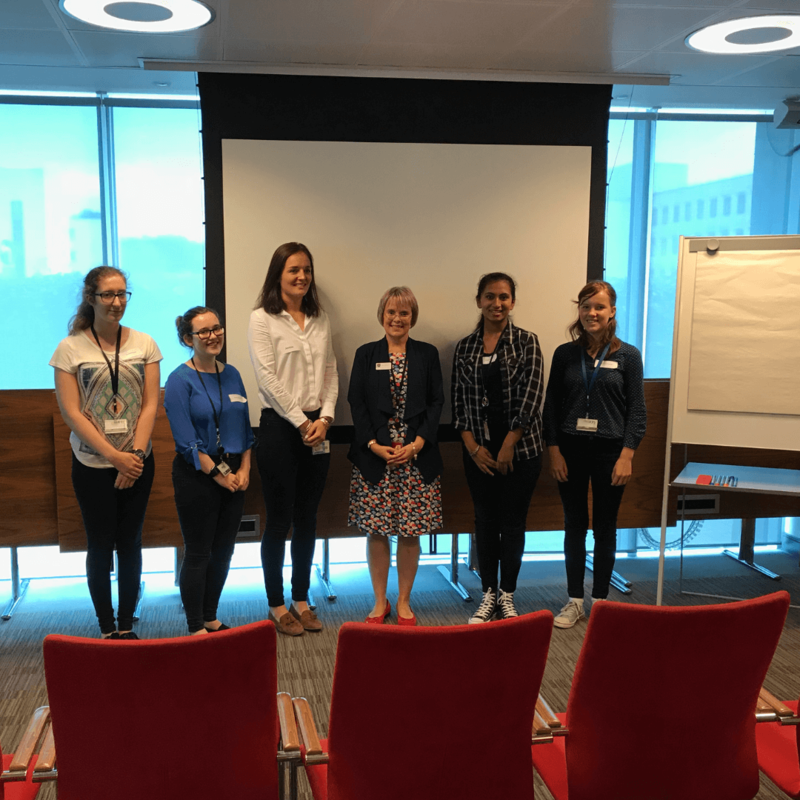 I often find myself being the only female in a team, or in meetings, but this is changing with time as more young female engineers and apprentices are joining the industry. At Chevron, there are female professionals throughout all levels of the company, many in management positions including our current managing director. They are role models for those new to the industry. Chevron also has many mentoring and support initiatives that are aimed specifically at women. My roles within Chevron, so far, have been primarily office-based; however, ad-hoc trips offshore are required, so I have spent time both on large installation vessels and platforms in the North Sea, from a few days when we’ve had operational issues to a few weeks for installation of new subsea equipment using divers. I try to make the most of my time offshore as it is the best learning environment and I have always enjoyed the experience. In my current role, I am responsible for the delivery of small projects that add value to one of our existing offshore assets. This can be construction of new offshore facilities on the existing platform or trialling new offshore operations. We work with many different companies to engineer, fabricate, test and install these facilities and the existing assets have many other activities going on at the same time, so my primary role is to co-ordinate the scopes and make sure the project is ready on time, to specification and without impacting daily operations. Since joining Chevron, I have been able to work in a variety of different roles, both in the office and offshore as well as travelling within Europe and America. Travel and exposure to different working environments has been very interesting in my early career. The Women in Engineering Conference was a great success. How did it feel to be part of that? For me, the decision to pursue engineering was clear from a relatively young age, and I was fortunate to have found an interesting career path through a summer placement while at university. I know that for others, it will not always be this simple or clear, so events like the Women in Engineering Conference are the ideal conduit to raise awareness of engineering as a career and the opportunities that are available. I think this is invaluable for girls interested in STEM subjects and there are more events and initiatives like this needed! What advice would you offer to girls considering a career in engineering? Seeing female engineers in management positions throughout the company continues to inspire me as I progress in my career at Chevron, so I know how important it is to have visible figures of all ages and experience. For girls trying to decide what career to pursue, I think having real examples of others who have shared similar education paths and found a successful and enjoyable career on the other side is both motivational inspiring. Do you have any interests outside work? I try to keep fit, mostly at the gym but I also started road cycling over the past few years, taking part in the ETAPE cycle round Loch Ness. I got married this year and we spent our honeymoon exploring Machu Picchu in Peru. This was a dream trip for me as I am a bit of a history geek and always try to plan in a visit to some archaeological site when we are on holiday.